If you are looking for information on the Snip-its franchise business opportunity, Snip-its franchises or Snip-its franchising, then you have come to the right place. The last decade has seen the development of many successful businesses specially designed to wow kids. In 1993, when Joanna Meiseles sought a hair salon that catered to her young children, instead of a salon, she discovered a business opportunity. After two years of extensive research and planning, Joanna opened the first Snip-its salon in Framingham, Massachusetts to rave reviews. Now with over 50 franchises up and running, Snip-its is revolutionizing the haircare industry with its a branded entertainment concept focused on the specific haircare needs of children. The children's segment of the haircare industry, a $45 billion market, is currently estimated at $5 billion, with over 40 million children in the United States receiving a haircut an average of eight times per year. Snip-its is the only fully developed entertainment concept in the children's haircare market today, and one of the most innovative concepts in all of retail. 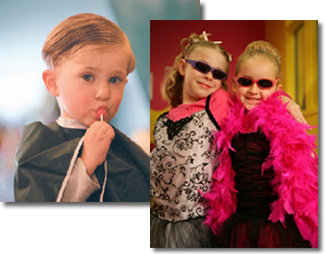 From start to finish, a haircut at Snip-its is truly an adventure! 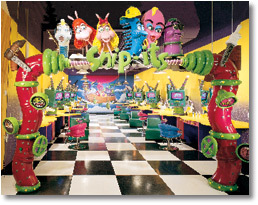 The Snip-its custom interiors feature our own cast of cartoon characters, interactive computer play stations, the Magic Box, and a complete line of haircare products formulated just for kids. Paired with floor to ceiling cartoon murals in splashy vibrant colors, Snip-its offer adventure and excitement in every visit. The Snip-its franchise program offers you the benefit of a brand with high consumer awareness, a service with strong demand and instantaneous customer loyalty, access to our proprietary point of sale and effective marketing programs, plus a system of operations that is second to none. The Snip-its business model is proven successful in its stores throughout the country. The corporate franchise team has fine-tuned unit-level operations in order to ensure that franchisees have the opportunity to invest in a highly successful business that will help them to achieve their personal and professional goals. Estimated initial cash investment required, assuming the franchisee leases the standard business premises recommended for a Snip-its salon. The standard business premises recommended for a Snip-its Salon is between 1,400 and 1,600 square feet with six cutting stations and one wash station. Larger or smaller salons may be negotiated. Snip-its' business systems are built on three legs of success: first, to "deliver magic" to all of our customers; second, to offer strong profit potential for franchisees; and third, to maintain a financially strong parent company. We believe that teamwork is the key to success - all in support of these common objectives. The relationship between franchisor and franchisee is a strategic association with mutual interdependency. Snip-its is committed to providing its franchisees with the highest level of support. We offer franchisees comprehensive assistance that ranges from guidance through the initial application process to the salon's grand opening, and beyond. Field and corporate support are included as part of the franchise fees. We provide the information and assistance needed to help grow business from day one, and we provide the tools necessary to keep business growing day in and day out. Snip-its is one of the fastest growing chains of children's hair salons in the country and is quickly emerging as the market leader with invaluable brand equity and share of mind. When our franchisees are successful, Snip-its is successful, and the Snip-its brand continues to gain value. We're counting on your success! We appreciate your interest in a Snip-its franchise and look forward to helping you achieve your personal and professional goals. Okay, I'm ready to open my first Snip-its unit. What's the next step?